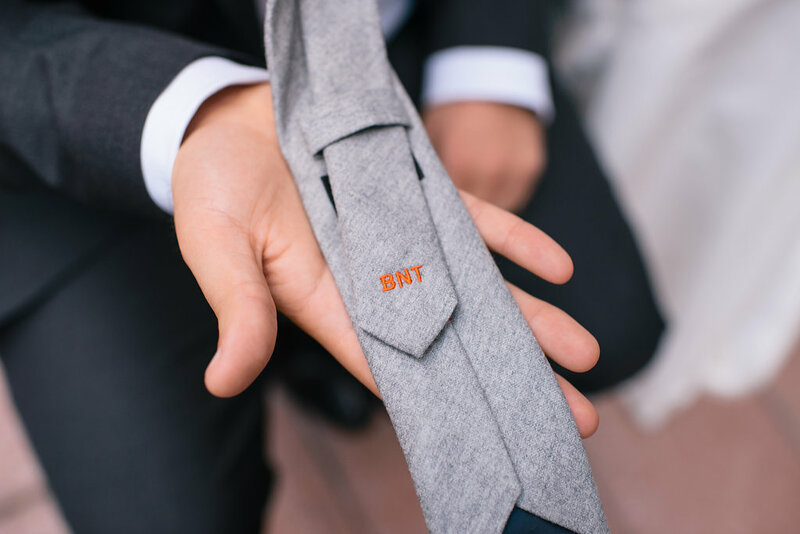 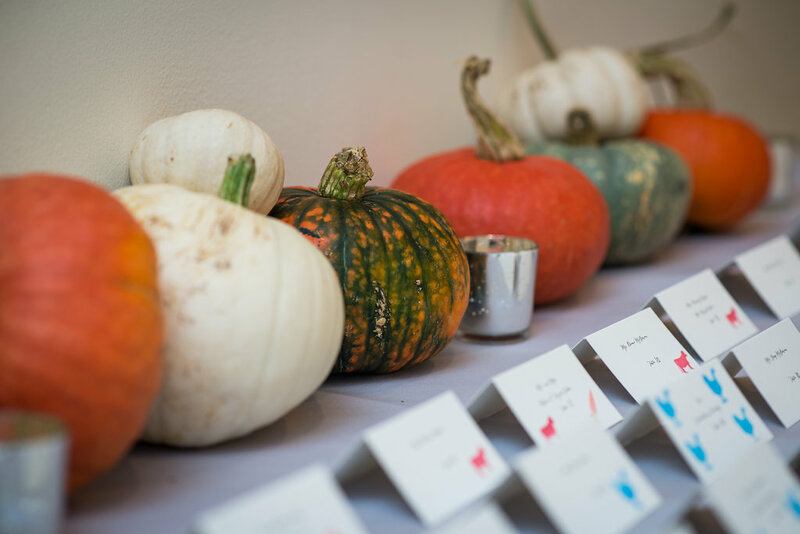 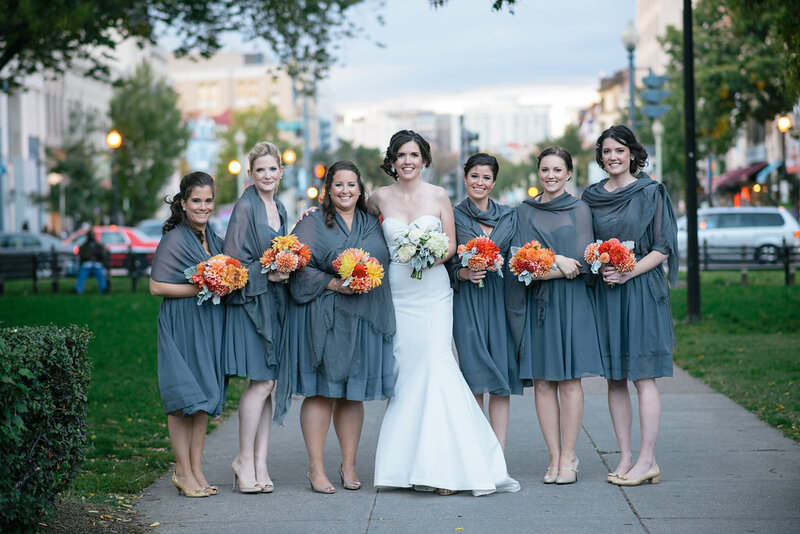 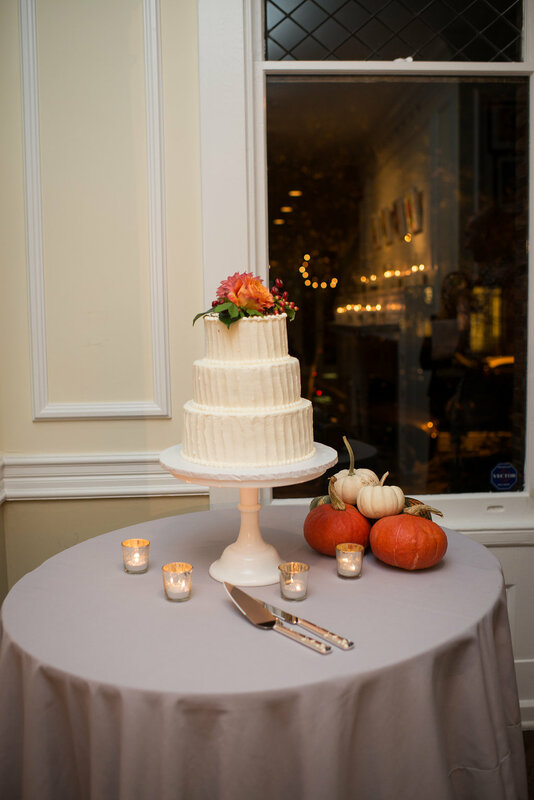 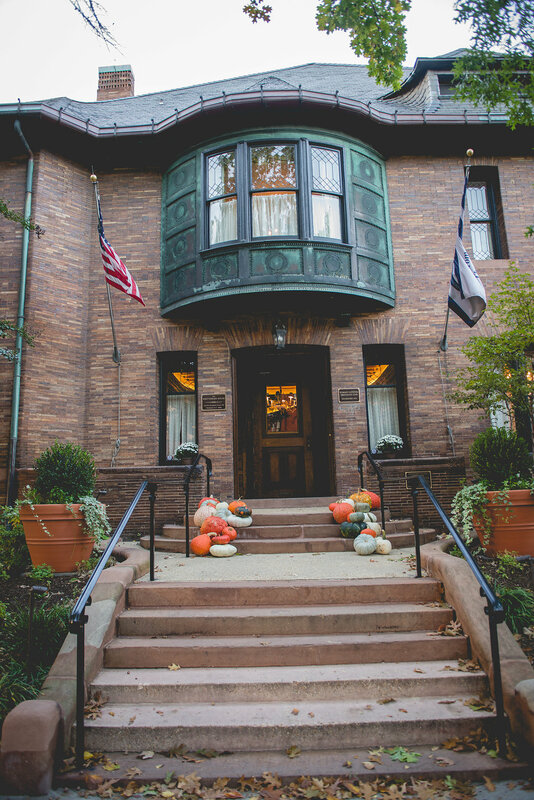 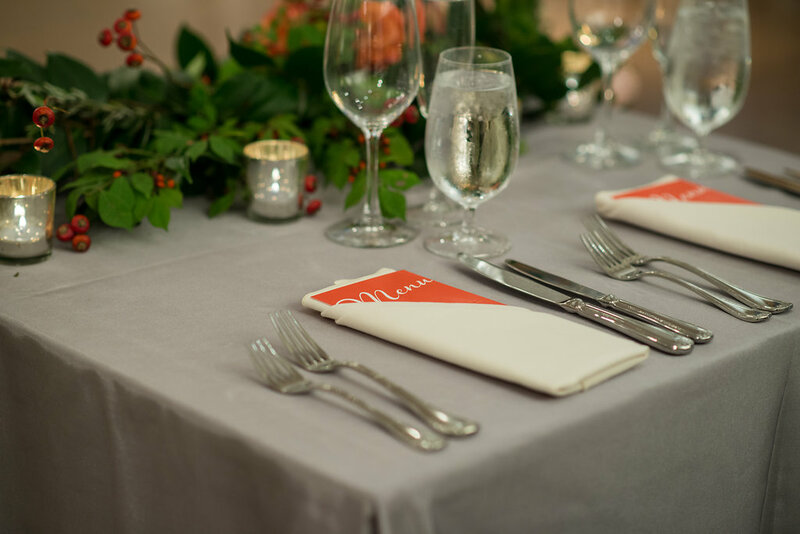 It’s almost Halloween, so I had to share Lesley & Brian’s The Whittemore House wedding from last October, which included an abundance of local pumpkins and a great color palette of gray and orange. 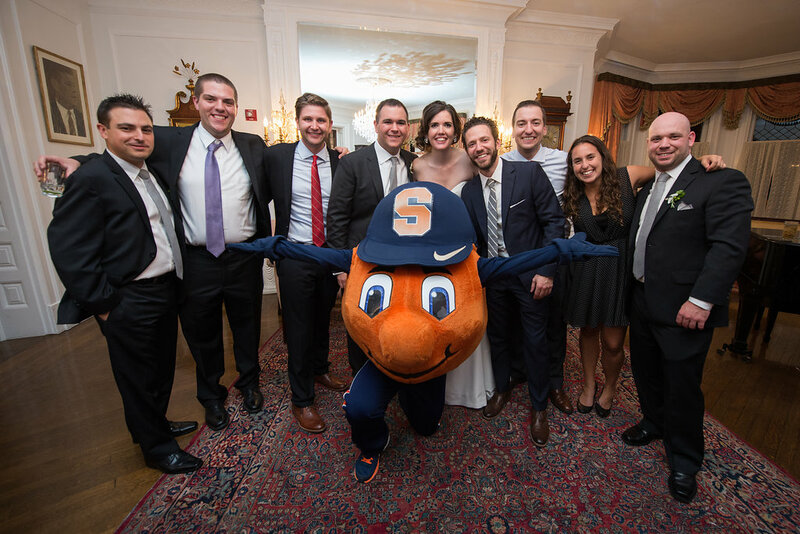 Being that I am originally from upstate, NY (and outside of Syracuse), I felt a special connection to these lovebirds who met at Syracuse University. 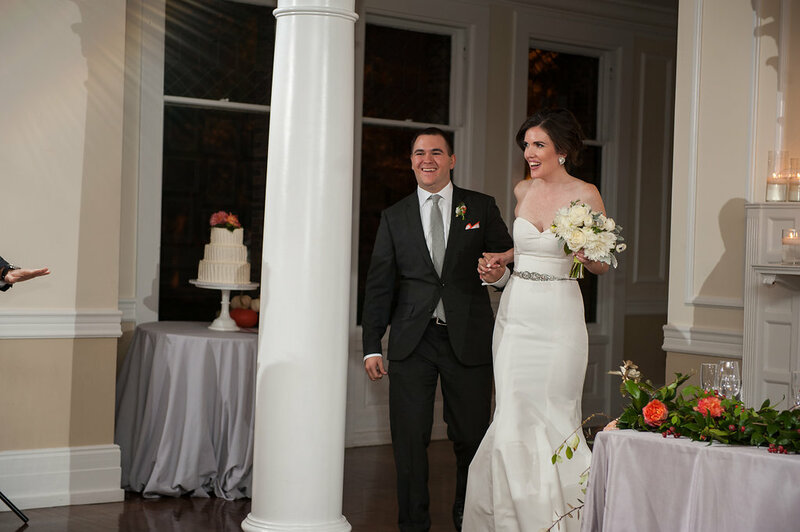 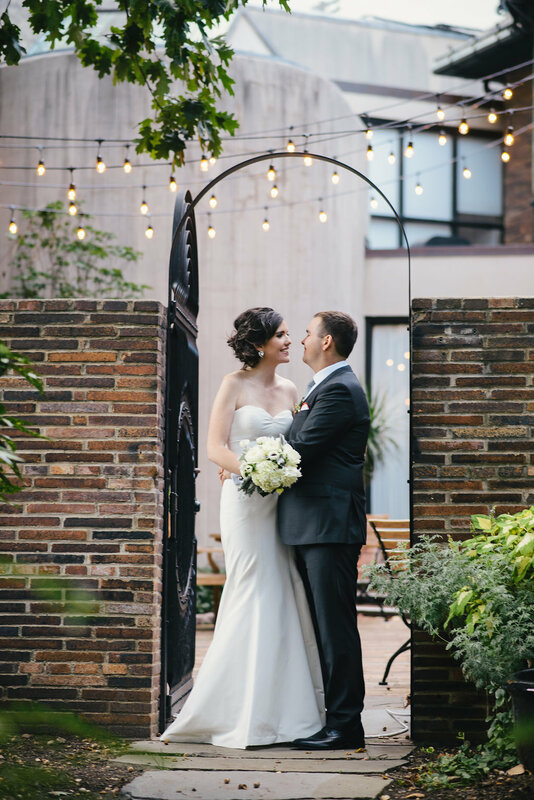 Their wedding was absolutely gorgeous and a whole lot of fun. 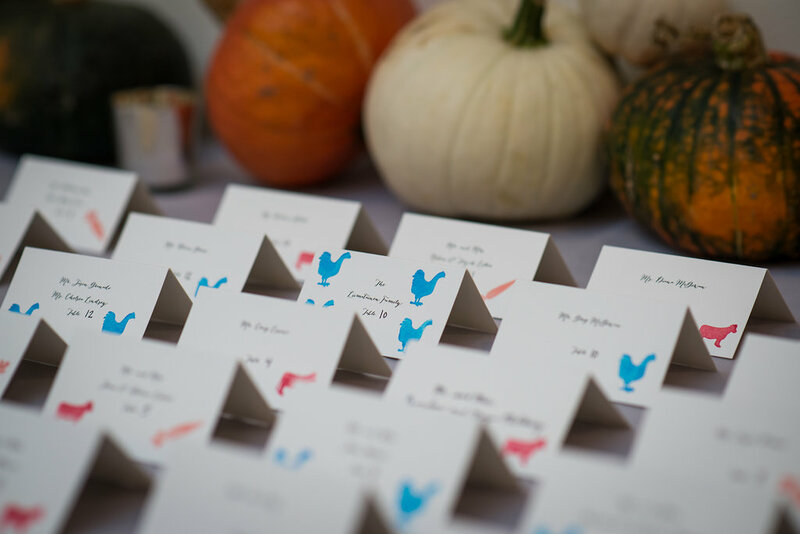 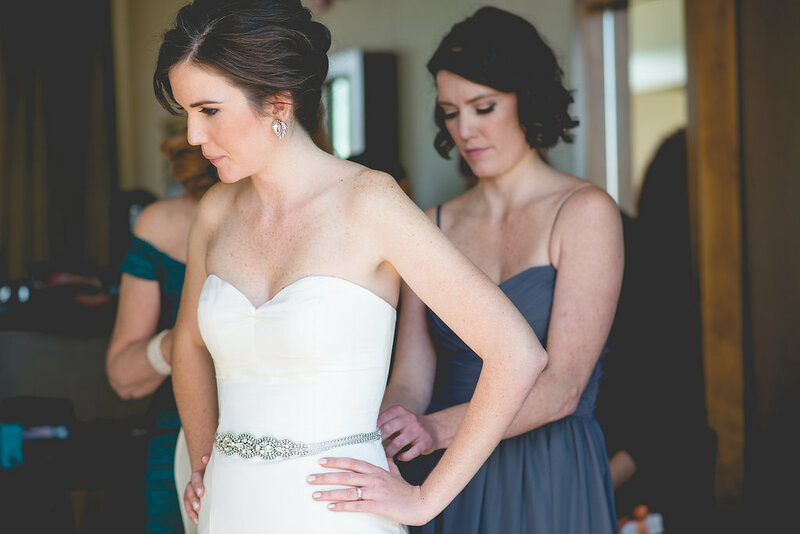 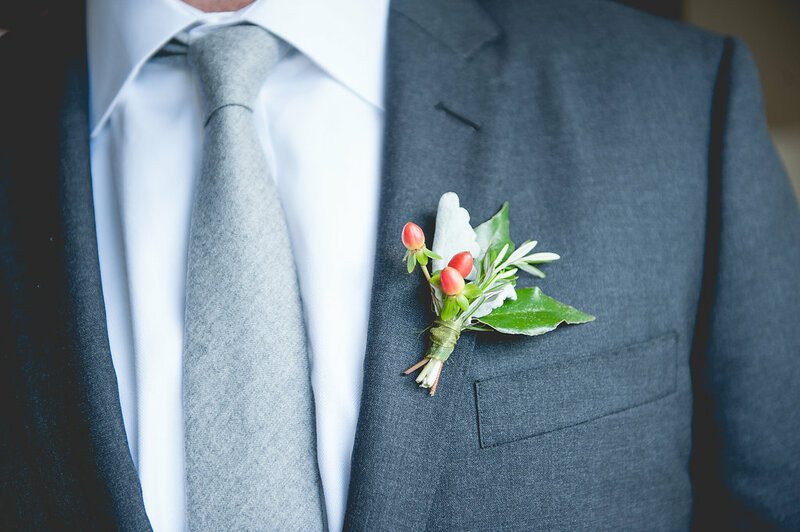 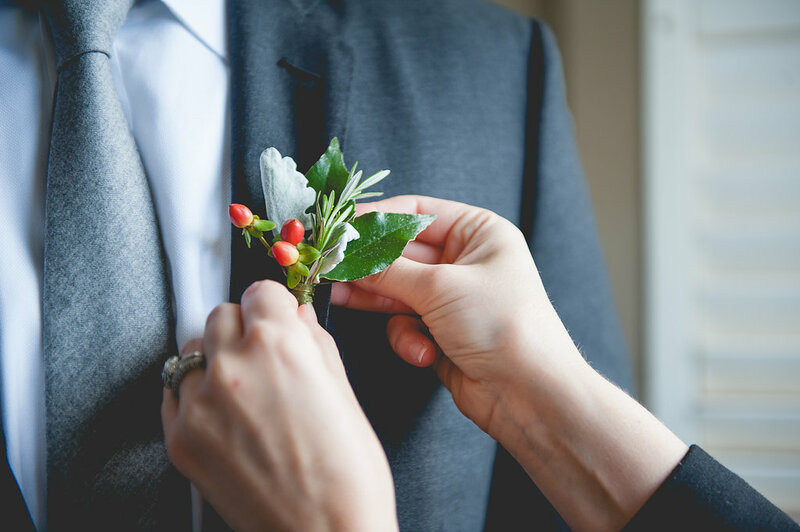 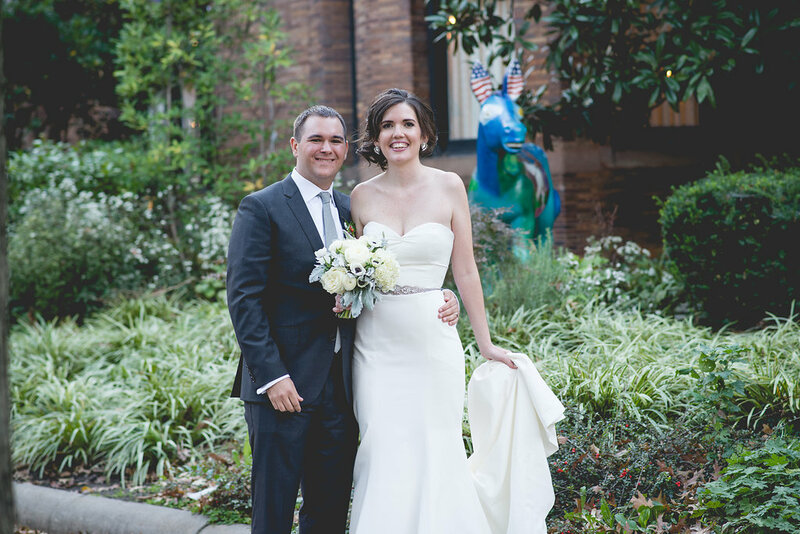 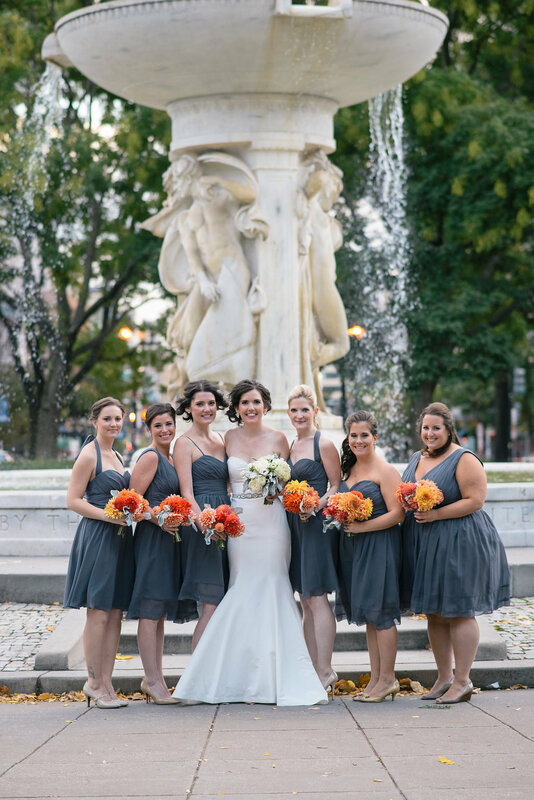 It was wonderful to work with Emily Clack Photography and some other favorite vendors (see the full list below). 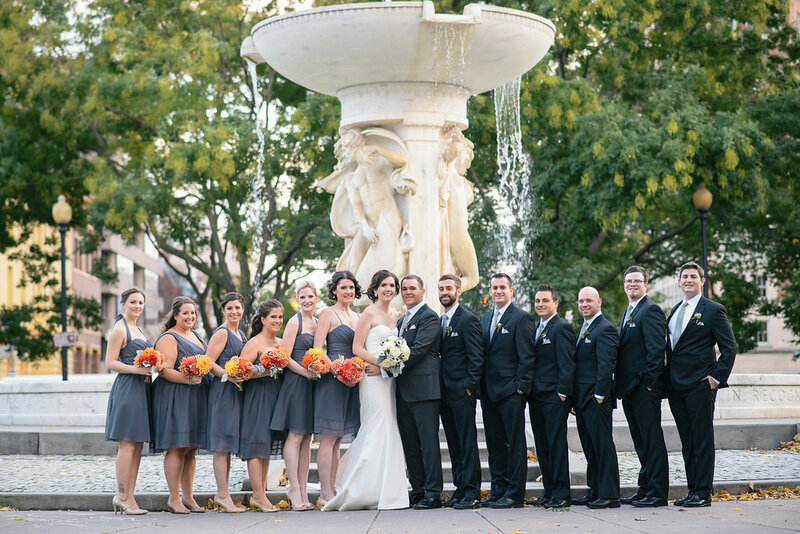 You can also see this wedding on District Weddings. 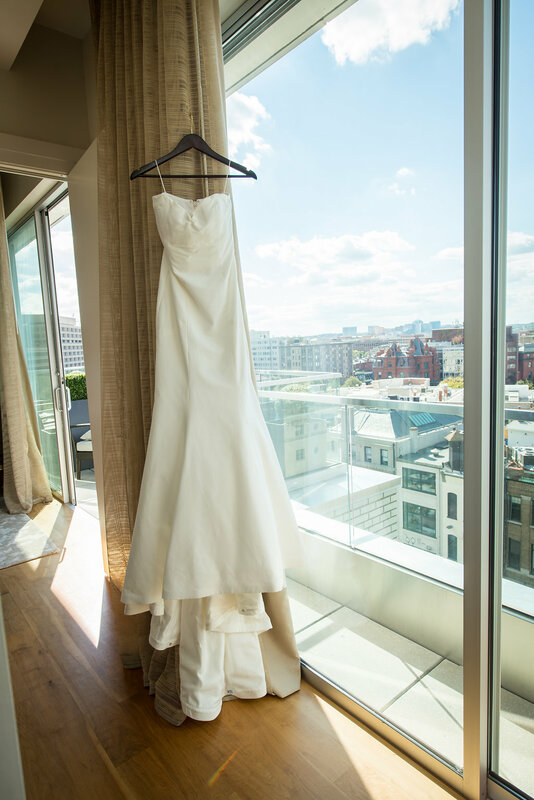 The day started next door at The Dupont Circle Hotel. 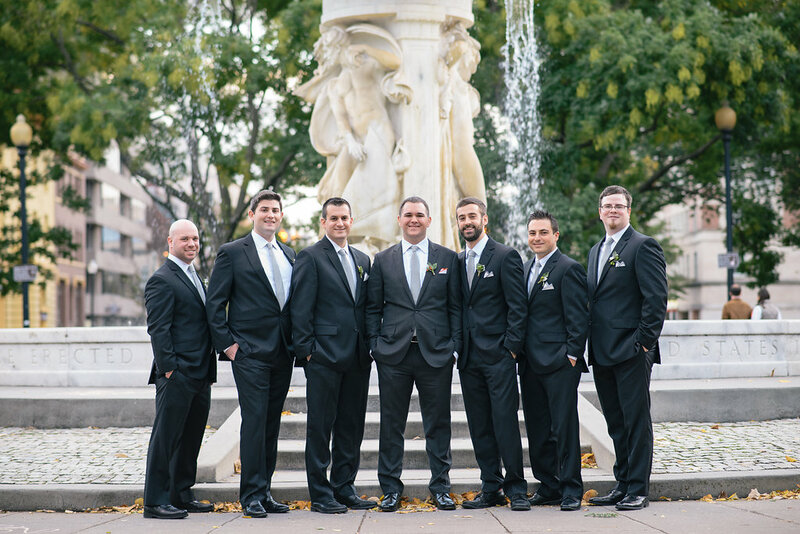 Brian and the guys hung out and got ready, while Lesley and her ladies spent the morning getting beautified by Jordan Winn & Co.
Lesley and Brian decided to do photos together before the ceremony. 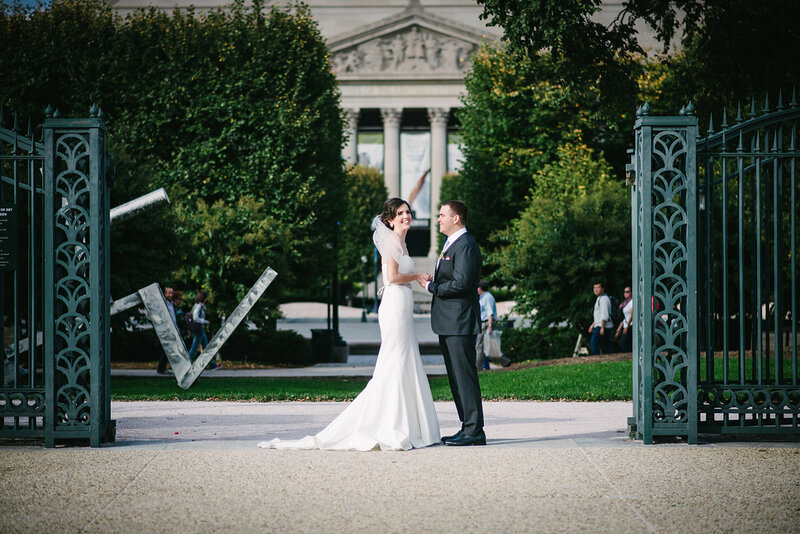 They chose to do a “first look” right by Dupont Circle and then head to the National Mall and Sculpture Garden for additional portraits. 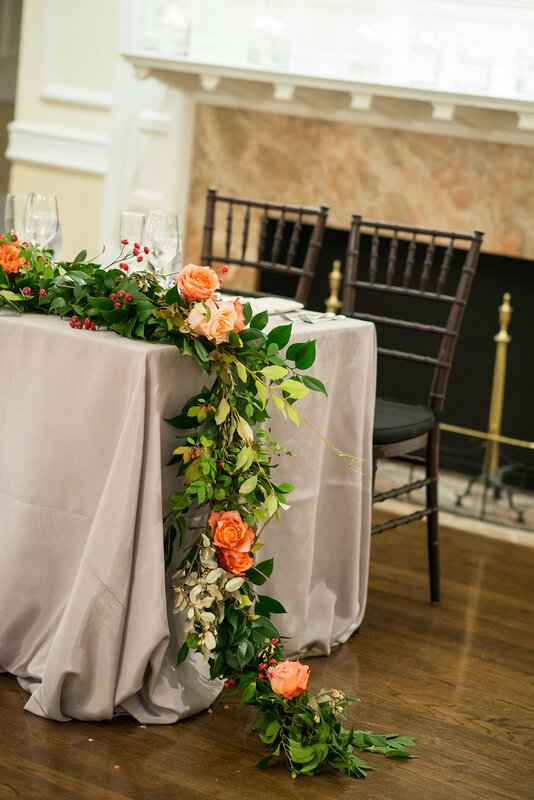 Meanwhile, we were setting up for their ceremony and reception at The Whittemore House. 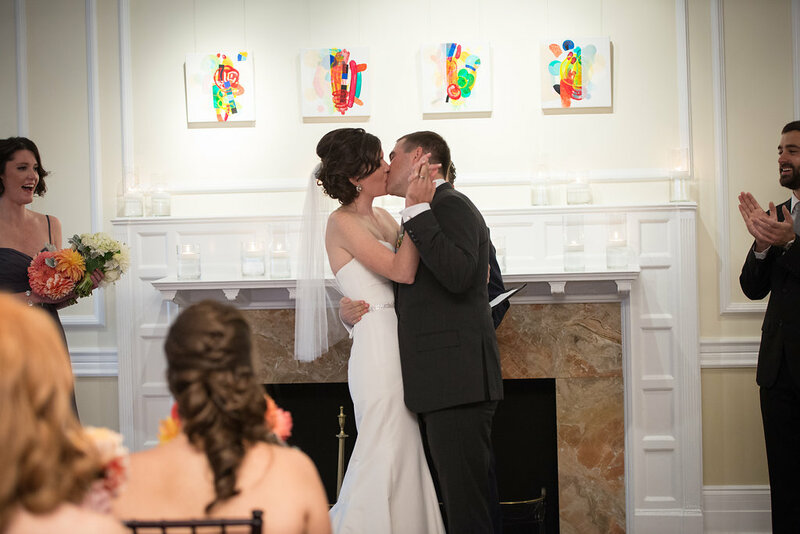 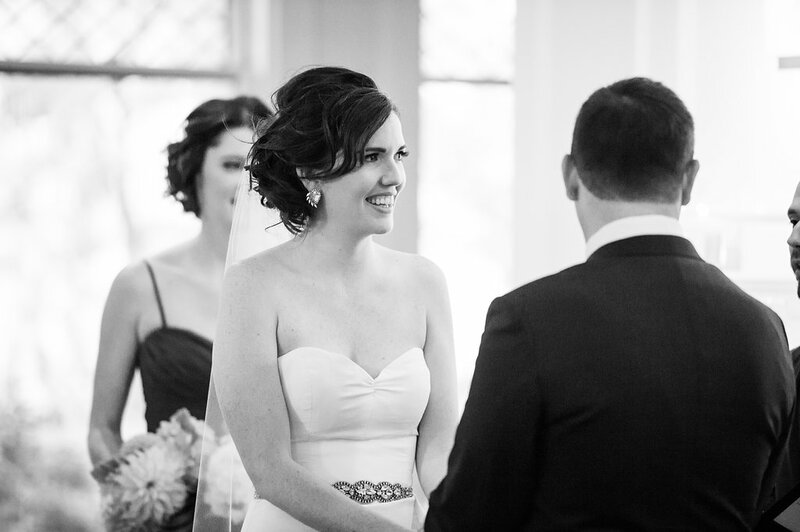 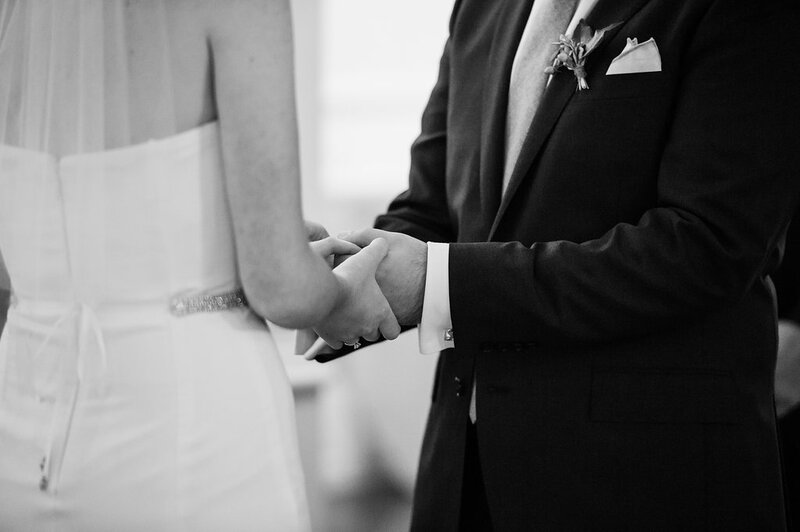 Their ceremony was officiated by a close friend who retold their love story. 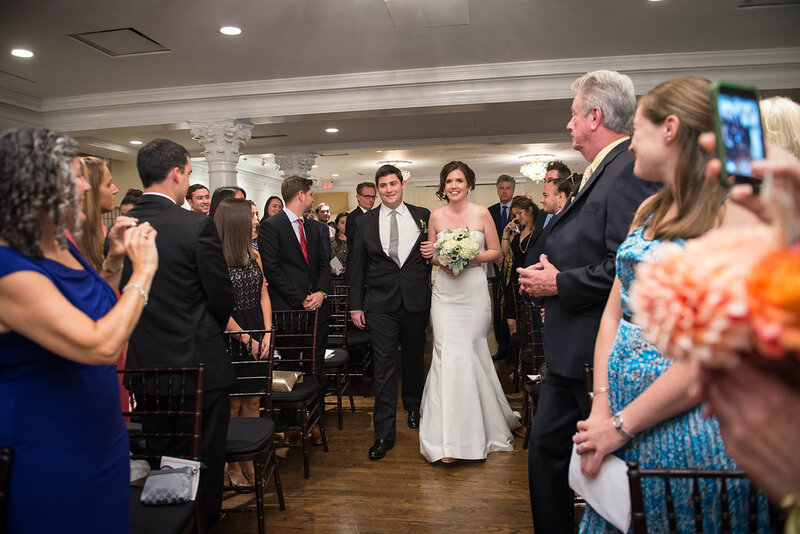 It was very intimate and personal. 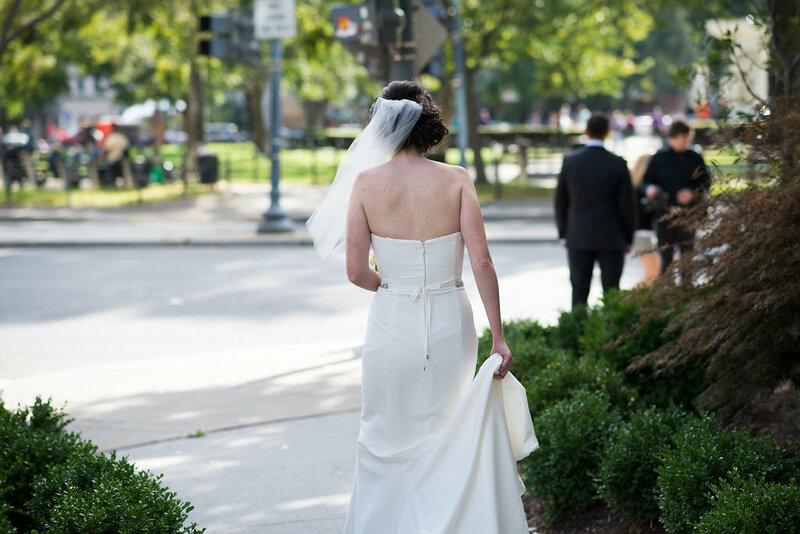 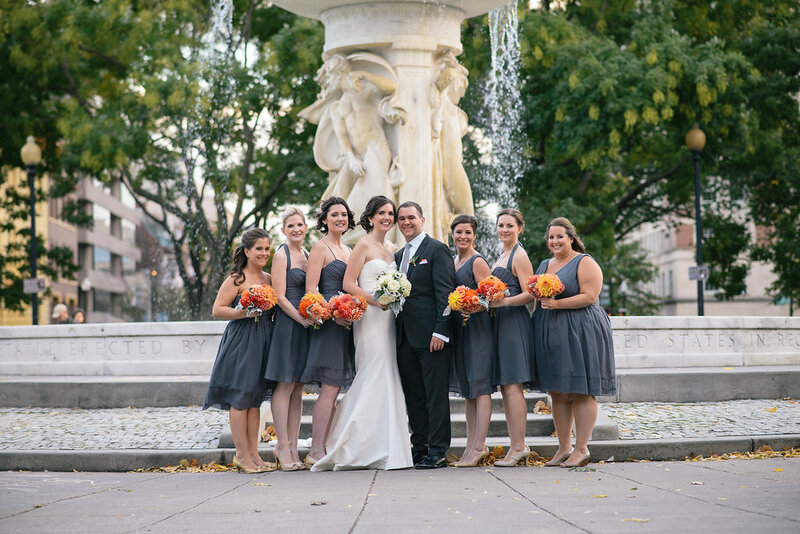 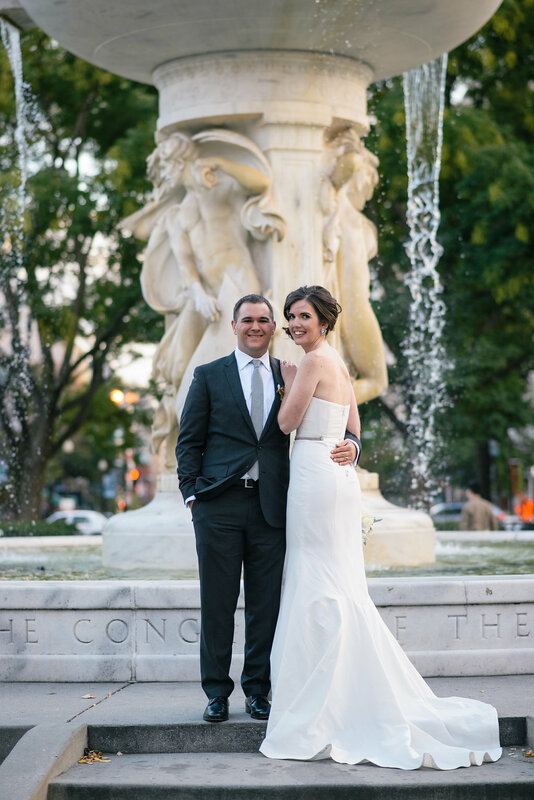 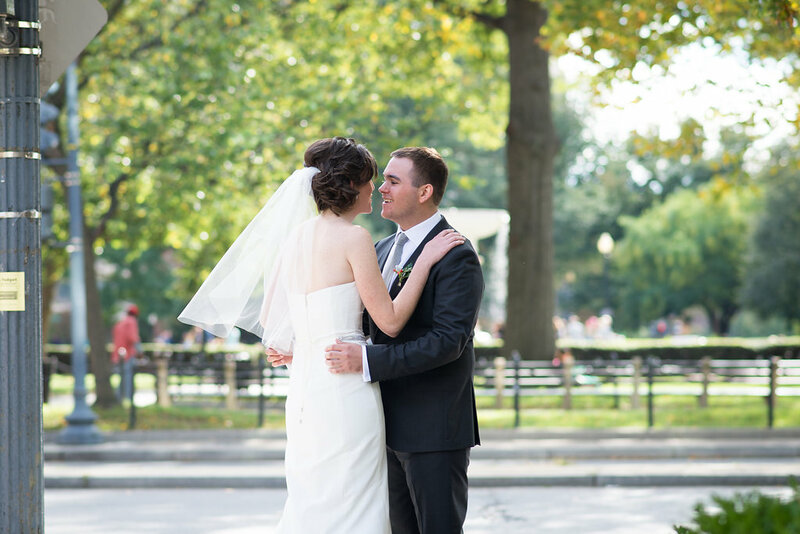 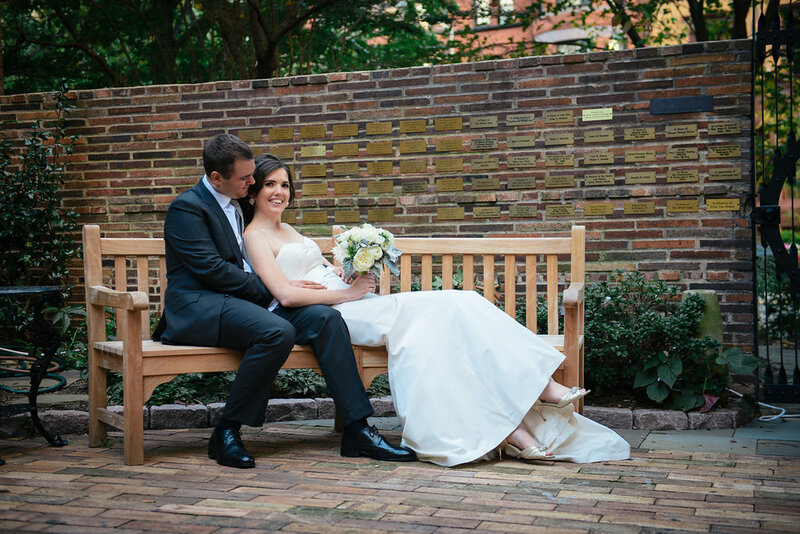 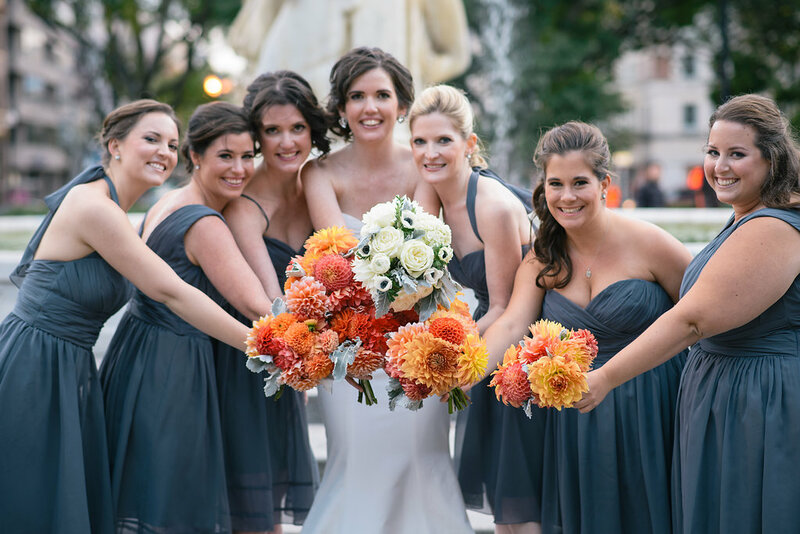 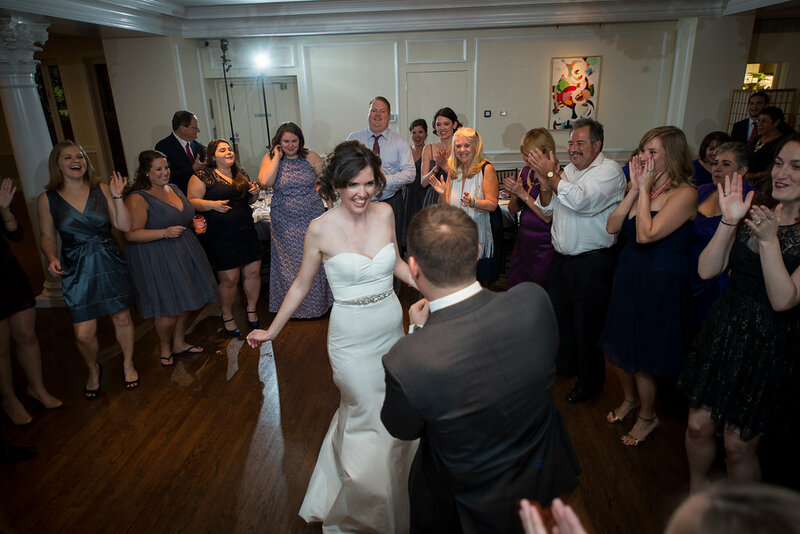 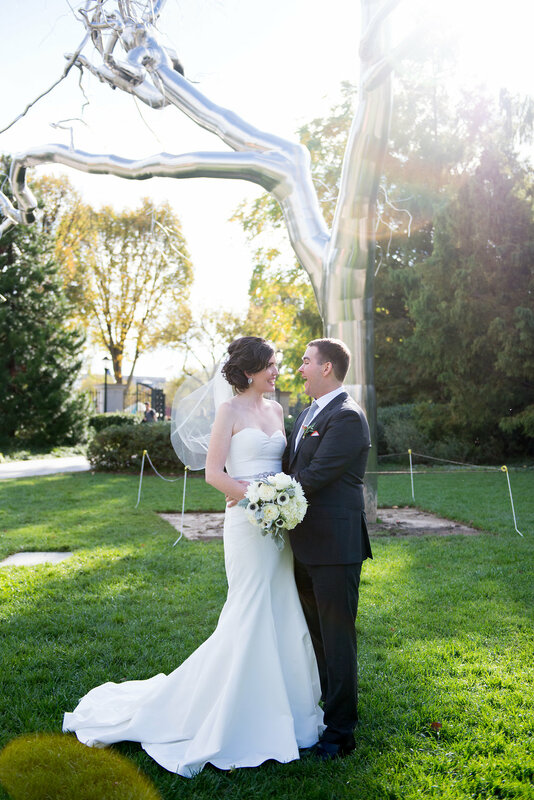 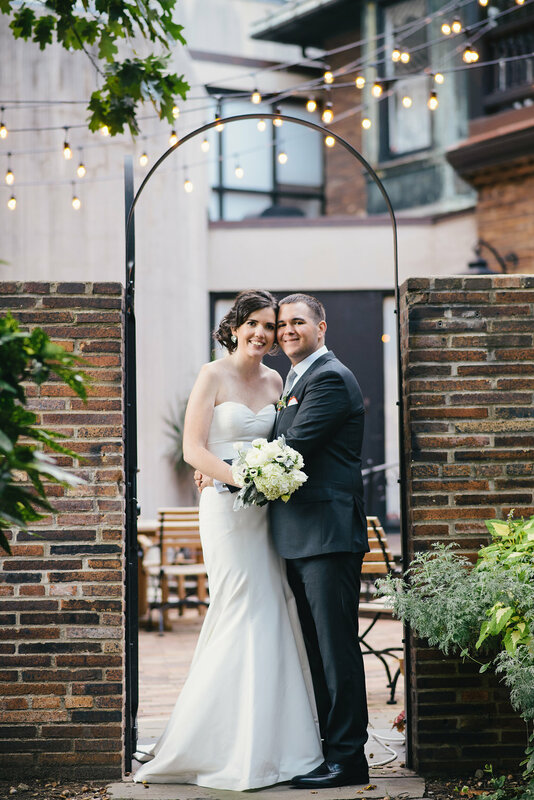 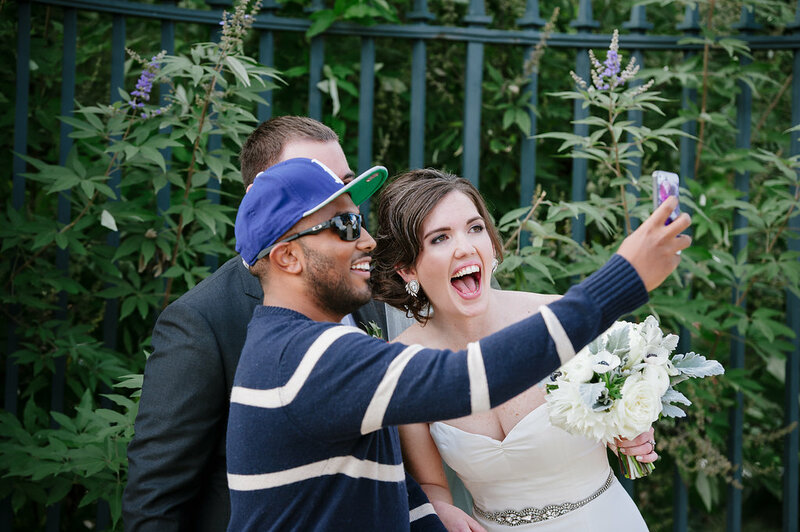 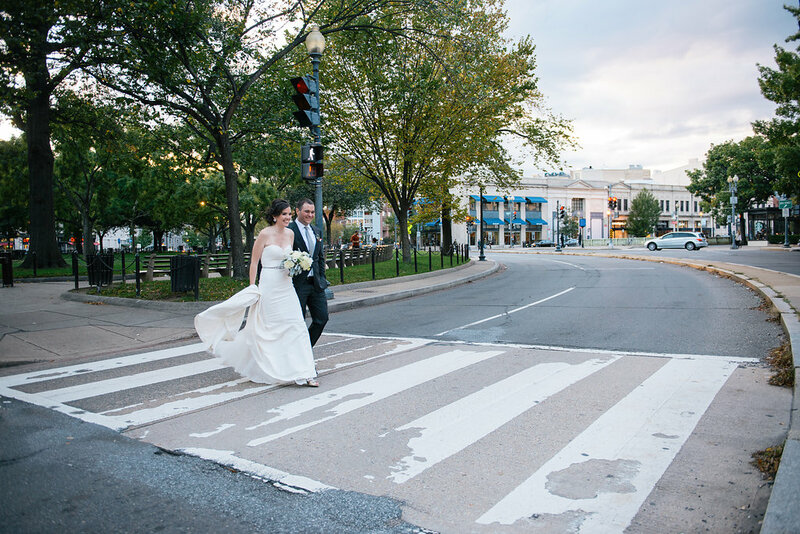 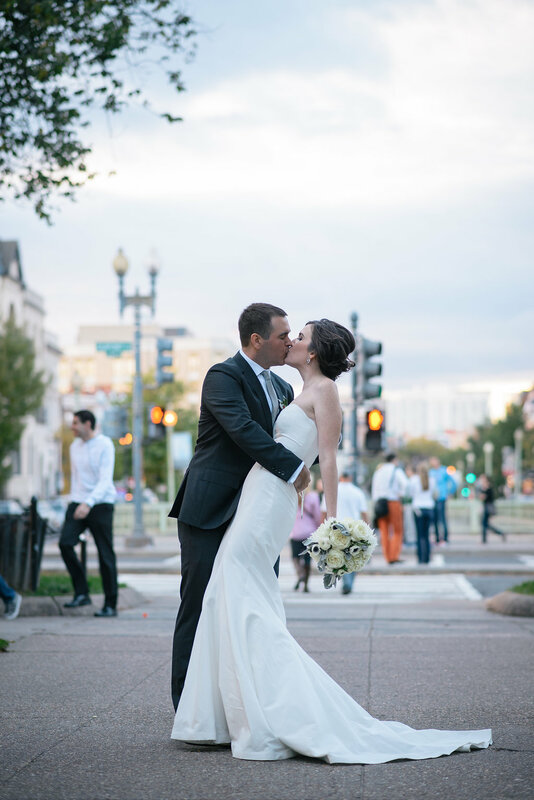 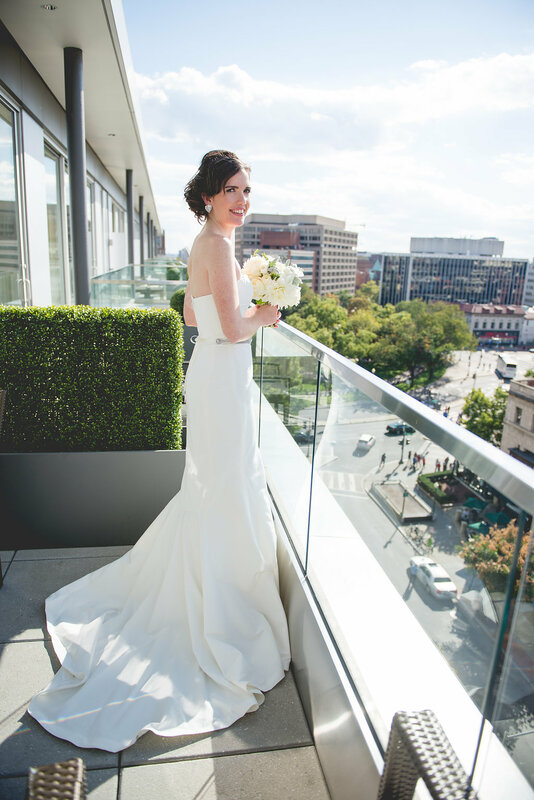 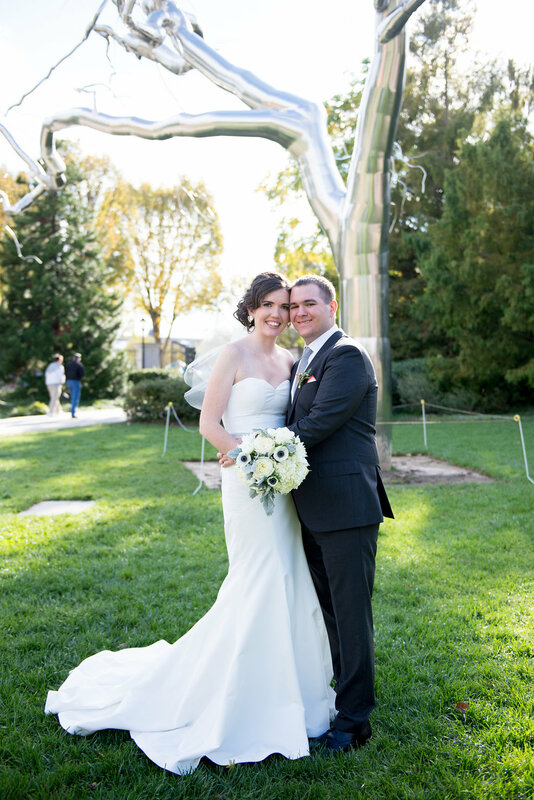 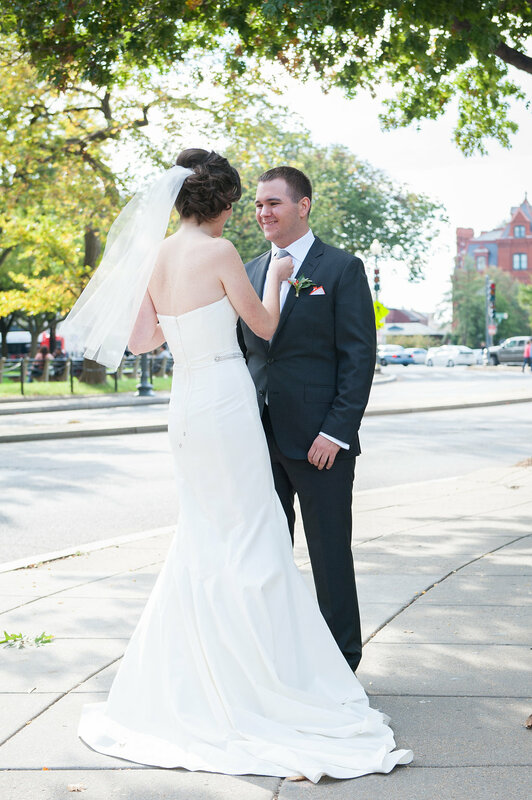 After the ceremony, the wedding party took some additional photos at Dupont Circle. 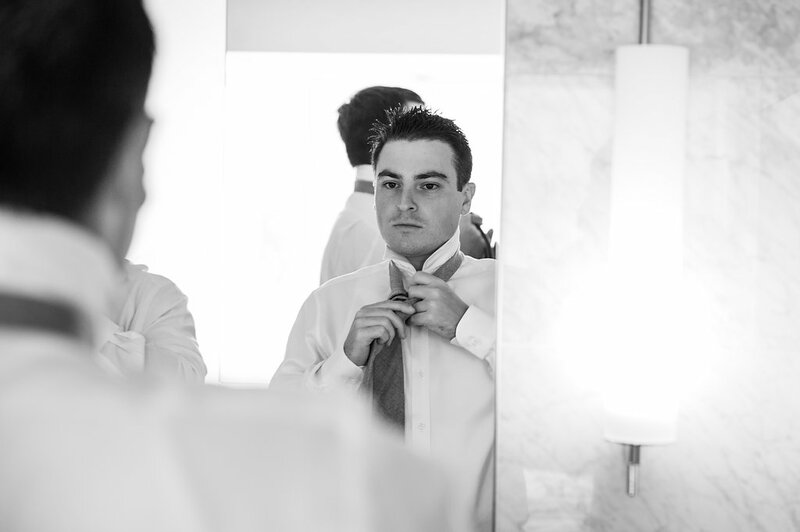 Meanwhile, we put the finishing touches down to get ready for dinner. 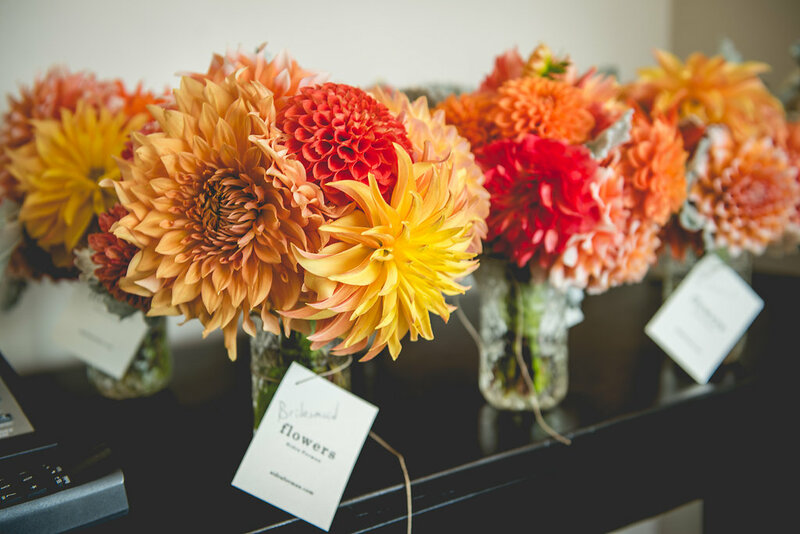 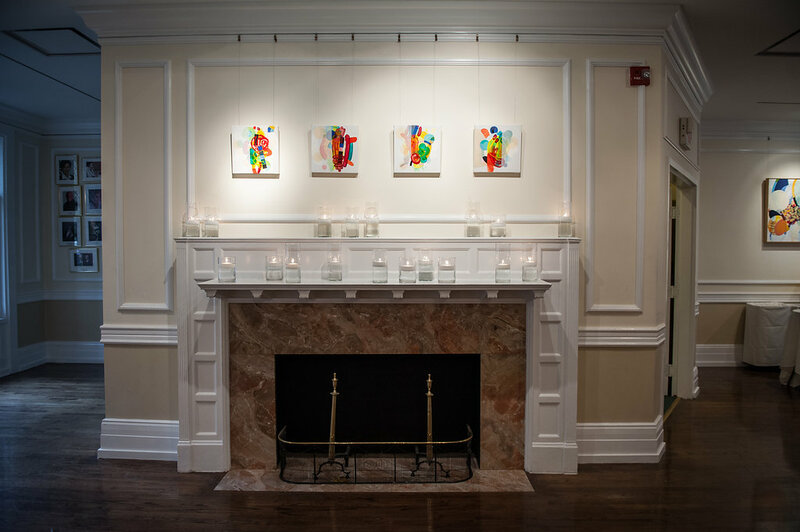 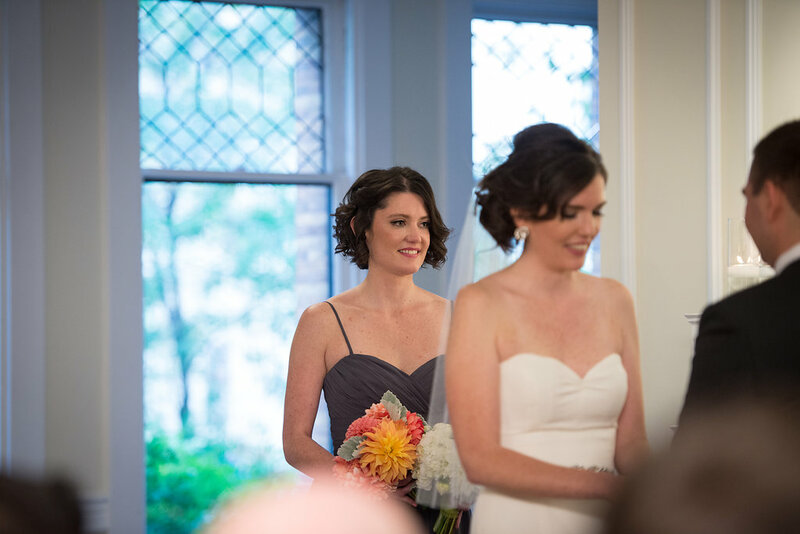 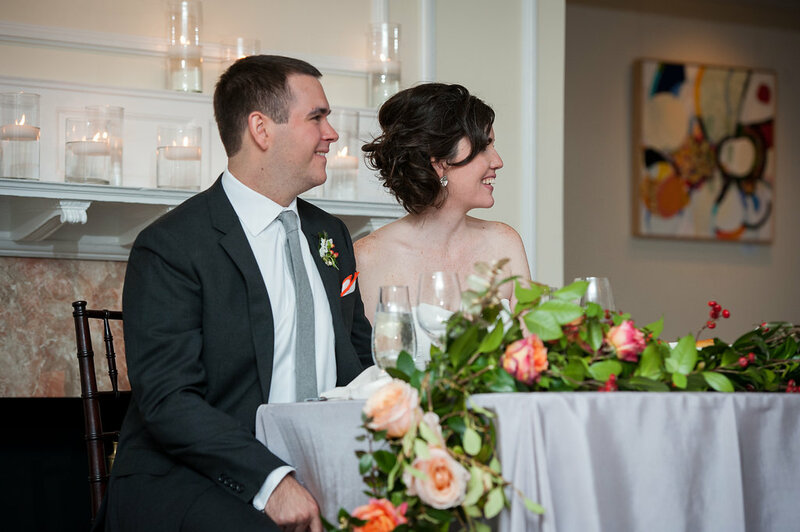 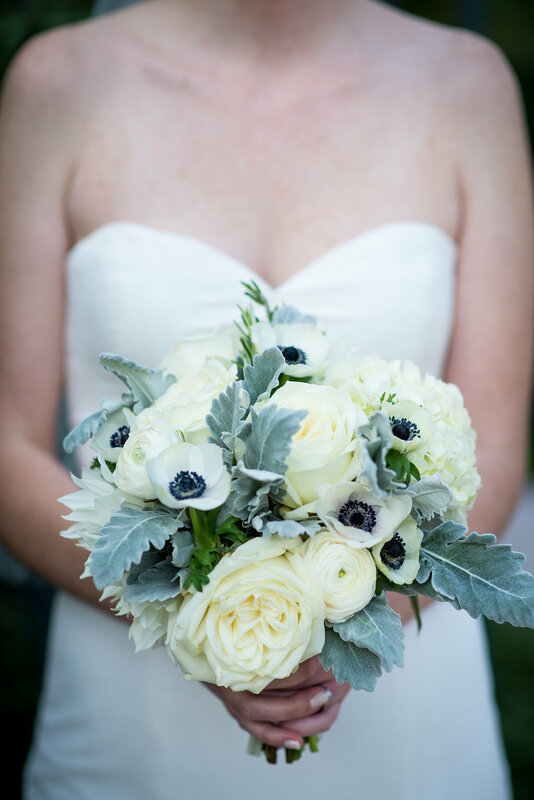 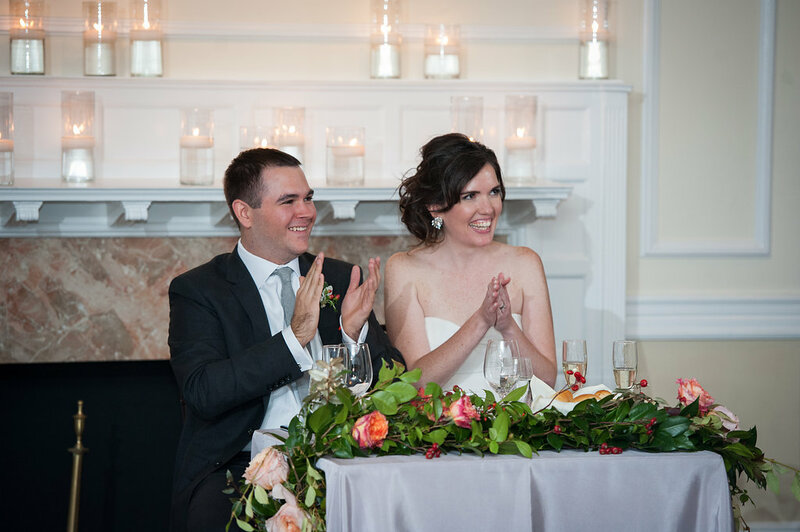 The lush blooms that florist Sidra Forman provided were even better in person. 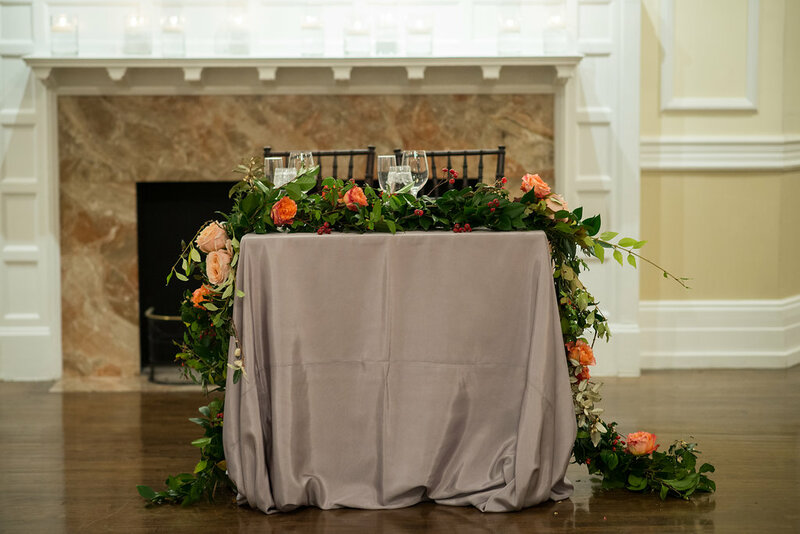 And I loved their cozy sweetheart table. 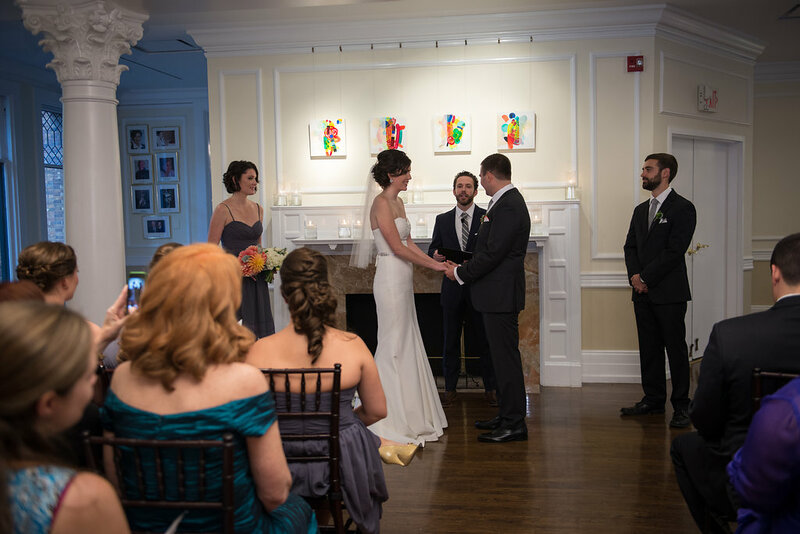 To start the reception, Lesley and Brian introduced their wedding party. 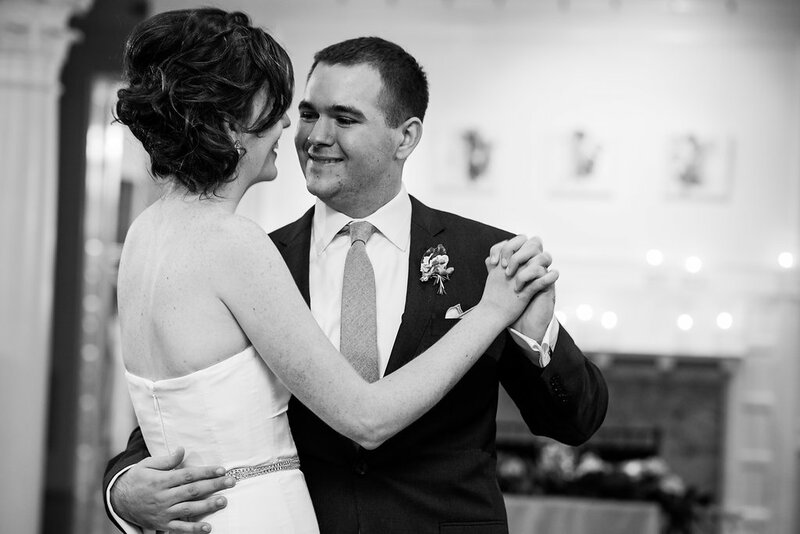 They then shared their first dance, followed by a short dance with all guests set to kick off the party. 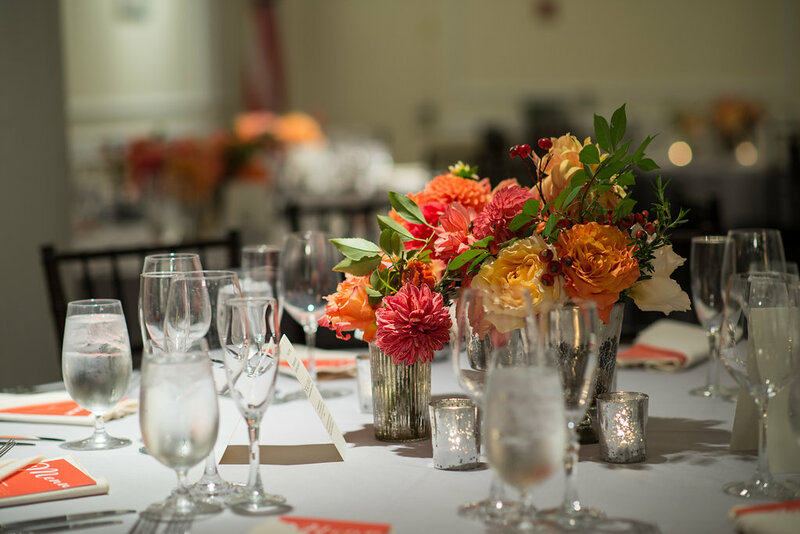 During dinner, toasts and good food by Spilled Milk Catering were enjoyed. 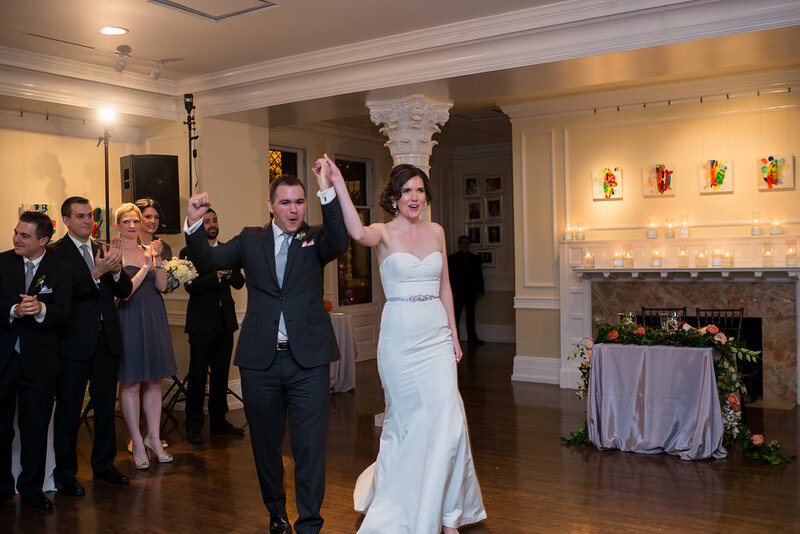 After dinner, Lesley and Brian enjoyed a fun dance party. 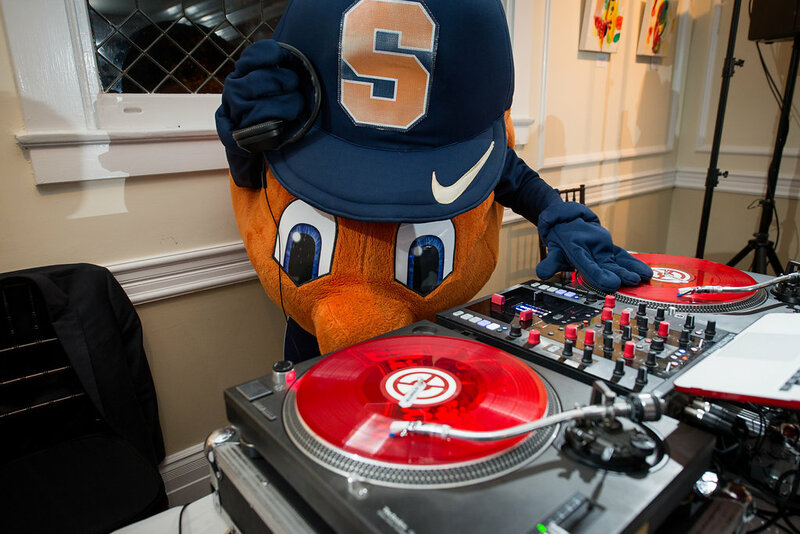 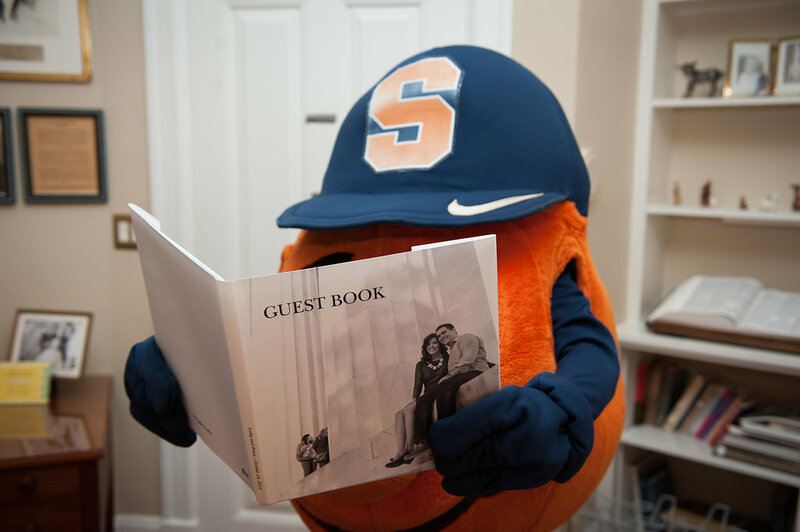 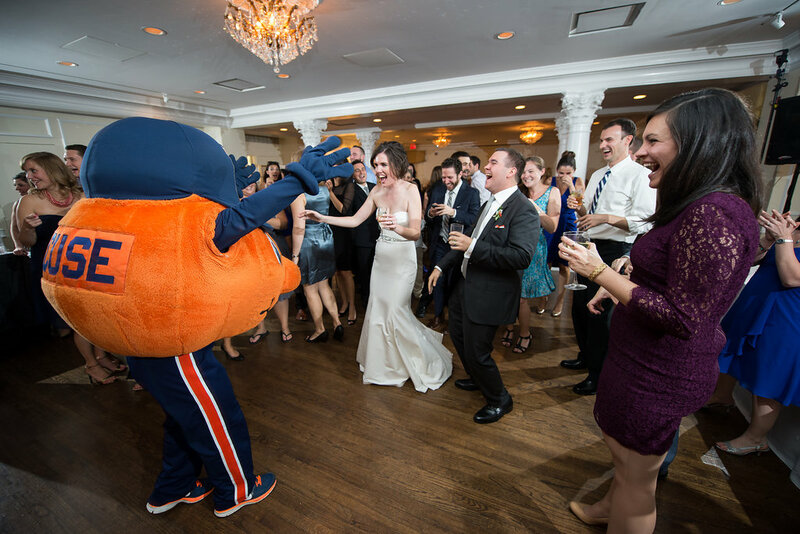 And later a special surprise…..
from the Syracuse Mascot, Otto the Orange! 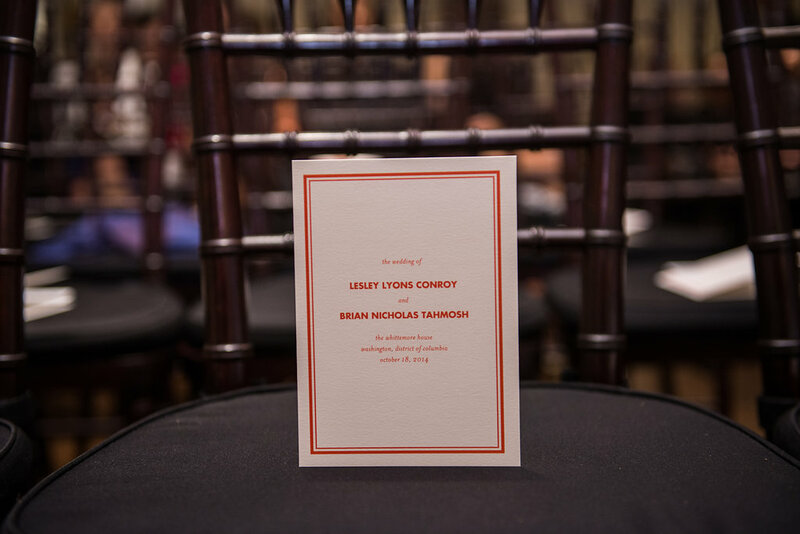 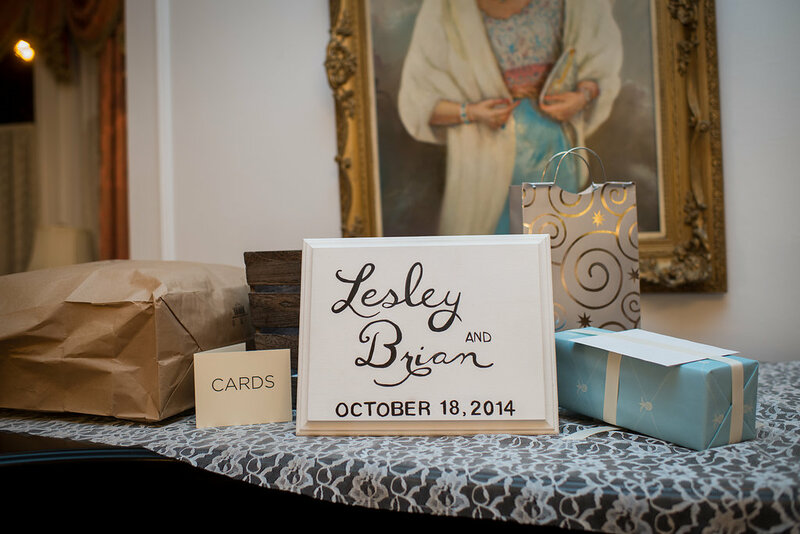 Congratulations again to Lesley and Brian. 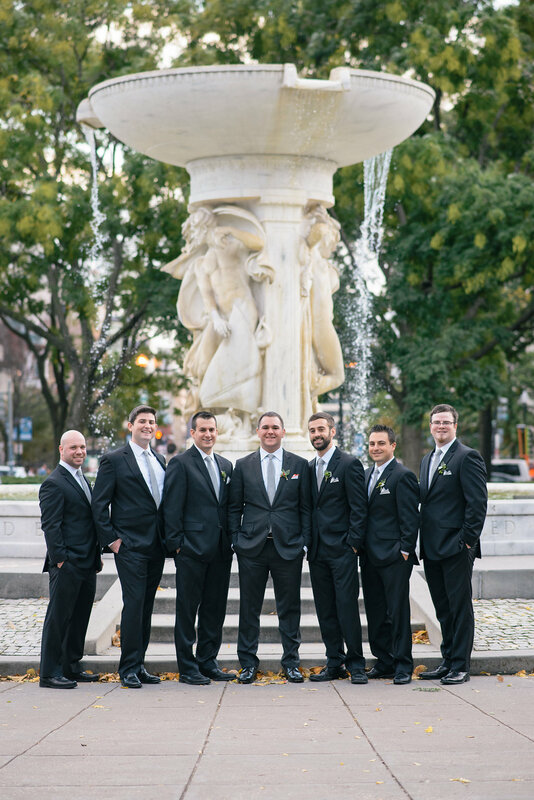 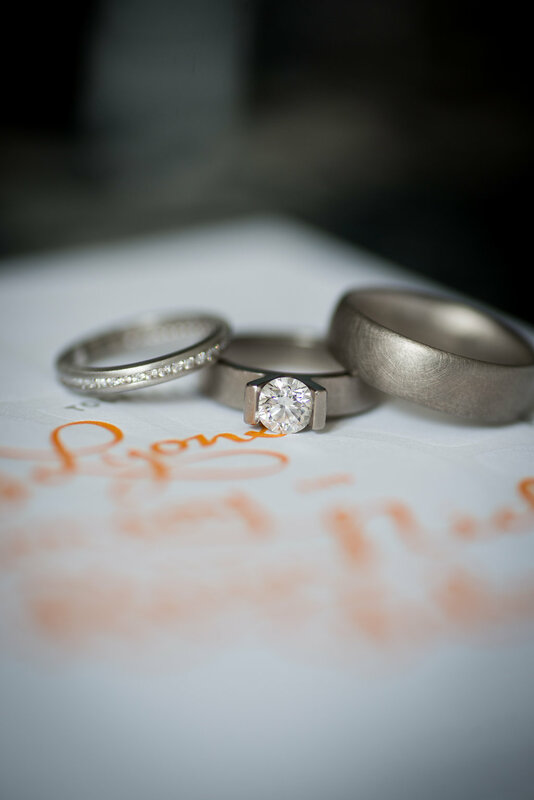 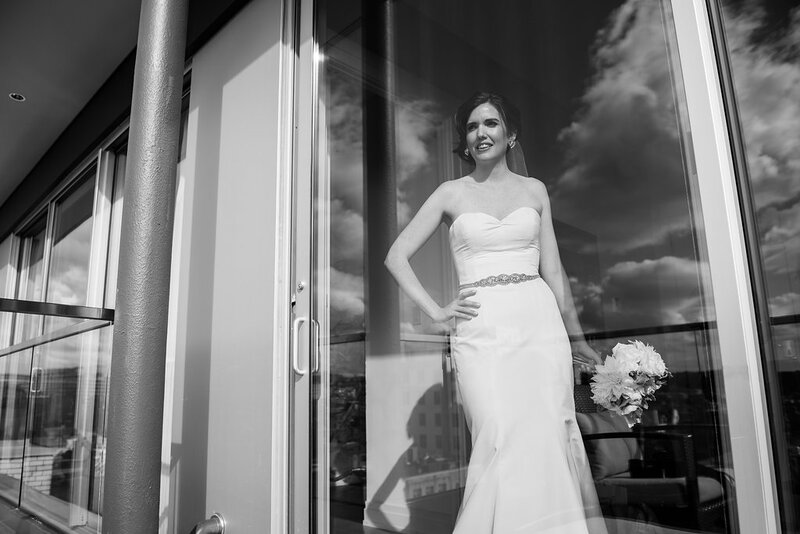 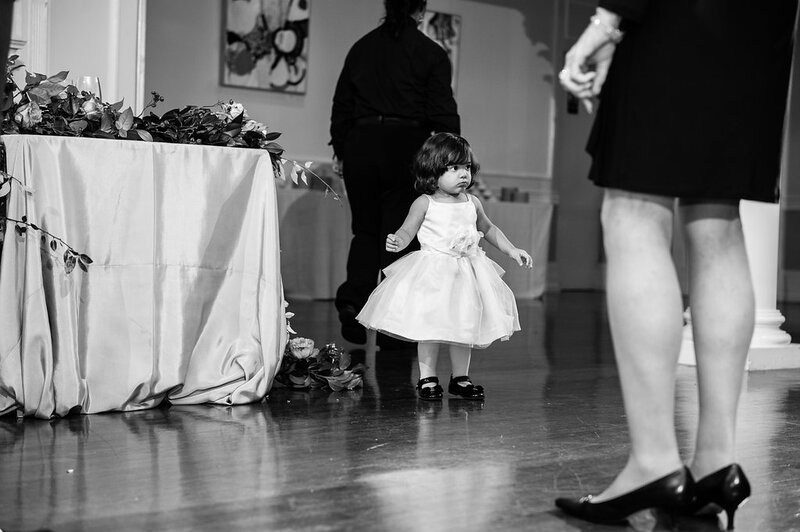 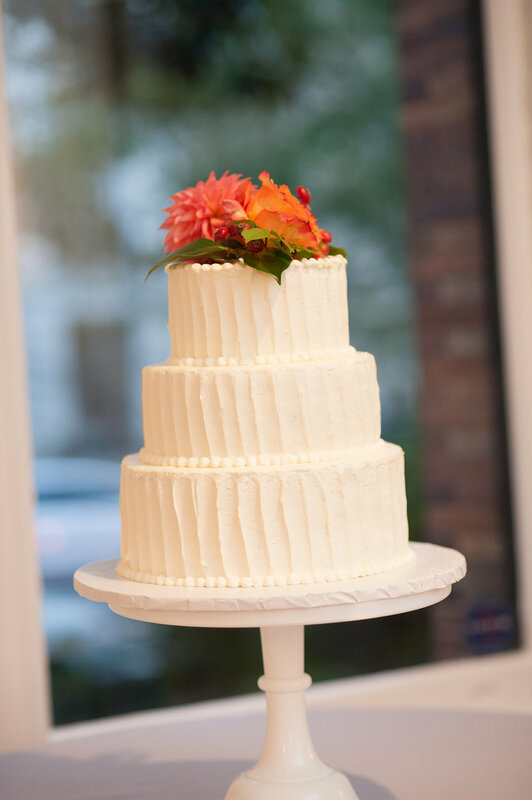 And a big thanks to Emily Clack Photography and the entire vendor team for making it a great wedding.